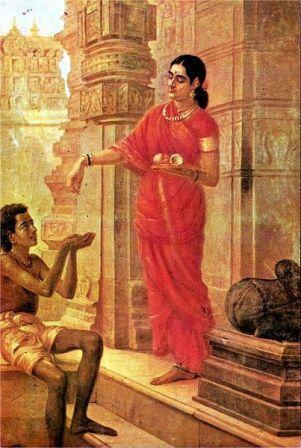 Bhiksha is a very old Indian tradition and is very much different from the concept of begging. It is the custom in which the religious saints and ascetics go from door to door in search for food and alms from people. The main purpose of Bhiksha is self –effacement and conquering one’s own ego. Basically, it comprises of food which is served to a monk or a sadhu when the person makes a visit to a Hindu household. Many a times, Bhiksha also refers to the donations or offerings given to the Brahmans, the upper- most caste of the Hindu society. These donations comprise of land, cattle or even gold in exchange for the Karmkand. Alms or almsgiving is a religious rite which, in general, involves giving materially to another as an act of religious virtue. It exists in a number of religions. Bhiksha is different from begging as the aim of Bhiksha is not a dislike for work as that in begging. It is just a way of overcoming one’s ego and attaining Moksha, or salvation. The saints or the ascetics, who follow the Bhiksha tradition, are called ‘Bhikshus’. It means ‘one who lives on alms’. The bhikshus, apart from asking for food and alms, also follow a life of morality and good conduct. They also have to wear special saffron colored robes as this color has cultural and religious significance. The robes are made from a single piece of cloth and are usually received in donation. Many of them prefer white robes. The Bhiksha concept has an important aspect as it involves the saints and ascetics who have just begin their quest for salvation and their spiritual journey. It is one of the means through which they can reach the salvation. Bhiksha involves the approaching of the bhikshus to the strangers and asking them for food and alms. In spite of it being a customary tradition of India, many people show disrespect towards the saints and ascetics, and turn them away from their doors. When they are treated in this way, the patience they show is a part of their training period in which they have been taught not to take such a behavior as an offence and instead, they should move away smilingly accepting it as the will of the Almighty God. Here, their patience and endurance is tested. The saints and ascetics not only go from house to house for alms and food, but also for sharing the knowledge and wisdom given to them by their Gurus in the Gurukuls in exchange of which they receive food, alms or other commodities by the people. It is like the people have to sacrifice some of their worldly possessions for the spiritual wisdom which will be beneficial to them after death. It is a daily routine of many religious people who do not forget to give a portion of their food to someone who is needy or poor. This is done out of charity. It is basically the people from small towns and villages that follow this tradition, no matter how rich or how poor they are. On the whole, Bhiksha is a philanthropic activity that has its deep roots in the customs and traditions of Hindu religion and has also been mentioned in the Rig Veda. According to me, this ancient custom of Bhiksha is just not an old tradition but it portrays the character of the Brahmans, the highest rank of the society to be humble and gentle towards the lesser ranks of the society from whose doors they arrive to ask for Bhiksha. It is a way by which these people have to shun their ego away from themselves and also learn to control the misuse of power of their status in the society. This also raises a feeling of equality among all the ranks of the society. Another thing to be noticed is that it also develops a give and take relationship between the various ranks of the society. The saints and ascetics who ask for alms from the others not only share their teachings. They also give advice on the problems of these people through their learning. In India, it is very sad to see the conditions of these saints and ascetics at present. They are treated with thorough disrespect and dishonor. This is due to the fact that many people fake to be ascetics and roam about asking alms from door to door, just to avoid working for their living. These are very different from the real Bhikshus who do this to attain salvation and to let go their pride and ego.